The United States now has two new Commercial Astronauts. Virgin Galactic test pilots Mark "Forger" Stucky and Frederick "CJ" Sturckow were awarded Commercial Astronaut Wings by the Federal Aviation Administration (FAA) on Thursday (Feb. 7). 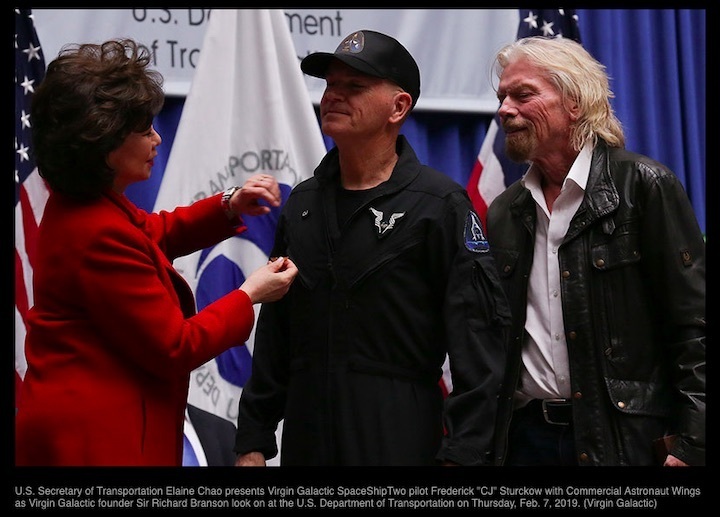 The two were recognized during a ceremony held at the Department of Transportation in Washington, D.C., for their Dec. 13, 2018 flight aboard Virgin Galactic's SpaceShipTwo "VSS Unity," which was the first time that the vehicle had flown into space. Stucky and Sturckow piloted the commercial suborbital craft to an altitude of 51.4 miles (82.7 kilometers) above Earth, surpassing the 50-mile threshold that the FAA and U.S. Air Force use to award astronaut wings. 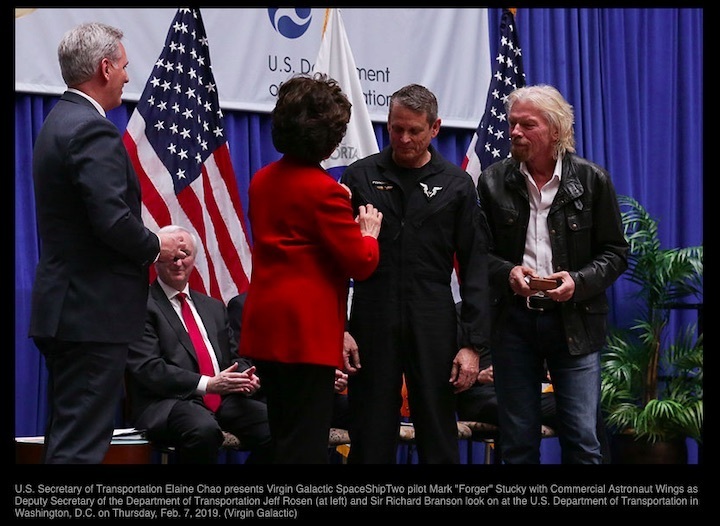 "These astronaut wings celebrate so much more than technological achievement," said Elaine Chao, U.S. Secretary of Transportation. "They are a testament to your skill, your professionalism and your persistence. You are true American patriots." 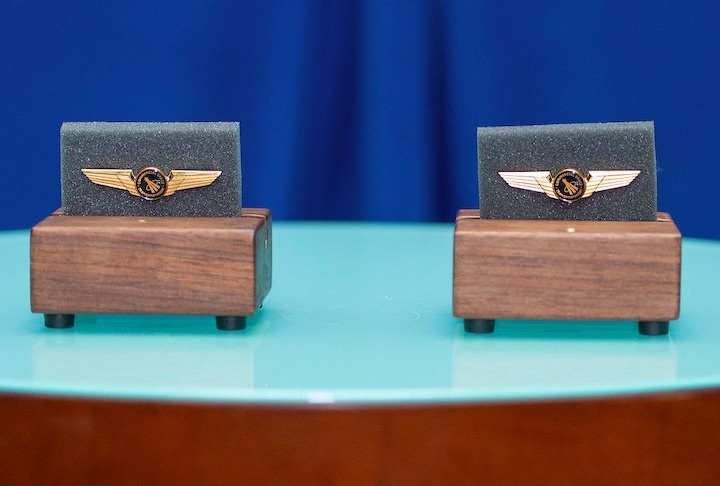 Thursday's presentation to Stucky and Sturckow was only the third and fourth time that the FAA has bestowed Commercial Astronaut wings. The distinction was introduced in 2004 to recognize Mike Melvill and Brian Binnie, who piloted Scaled Composites' SpaceShipOne on the suborbital spaceflights that led up to and won the Ansari X Prize competition. 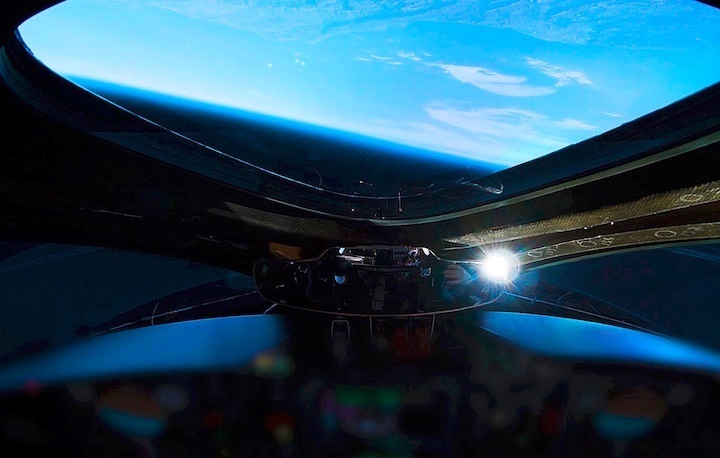 Virgin Galactic's SpaceShipTwo was built upon the design of SpaceShipOne to be suited to fly passengers on commercial launches. Stucky, who became the 568th human to fly above 50 miles, has been a pilot with Virgin Galactic since 2015. Previously, he flew for the U.S. Marine Corps and U.S. Air Force. From 1993 to 1999, Stucky served as a research test pilot for NASA at the Dryden (now Armstrong) Flight Research Center in California, flying the SR-71 "Blackbird," among other aircraft. He also worked as a commercial airline pilot for United Airlines. "Receiving Commercial Astronaut wings is an honor for me as it is acknowledgment of a personal achievement. 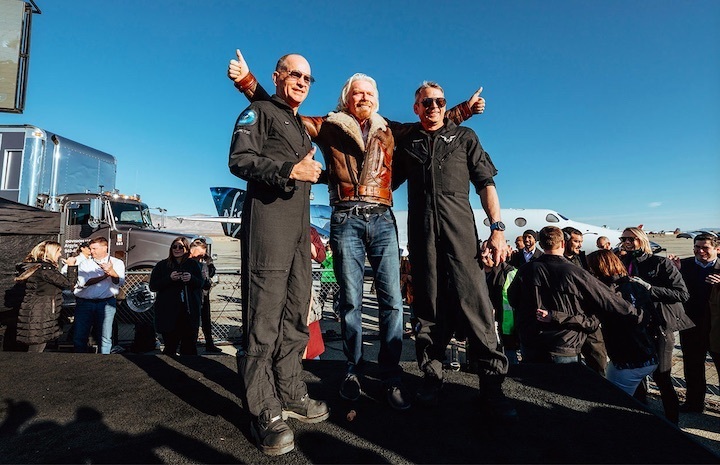 But it goes beyond that, it's really an acknowledgment of a company achievement," said Stucky, referring to Virgin Galactic, but also the engineers who built and tested SpaceShipTwo at Scaled Composites and The Spaceship Company. "And these wings are really dedicated to them." Sturckow is the only person to date to be recognized as an astronaut by both NASA and the FAA, as well as the only person to receive both Naval Aviator and Commercial Astronaut wings. A space shuttle pilot and commander, he joined NASA with its 15th group of candidates in 1994 and logged more than 50 days in Earth orbit on four missions to the International Space Station. Prior to becoming a NASA astronaut, Sturckow was a combat and test pilot in the U.S. Marine Corps. He joined Virgin Galactic in 2013. Sturckow is one of only four people in history to fly both suborbital and orbital spaceflights, including the first Americans in space, Alan Shepard and Virgil "Gus" Grissom, as well as X-15 rocket plane and space shuttle pilot Joe Engle. "It was a great flight and I can't wait to do it again," said Sturckow. According to the FAA, its Commercial Astronaut Wings Program "recognizes crew members who further the FAA's mission to promote the safety of launch vehicles designed to carry humans." Astronaut wings are awarded to flight crew who safely fly to and from space on an FAA-licensed mission. "While today's awards ceremony is, of course, a proud moment for our wonderful pilots and the whole Virgin Galactic team, it is also symbolic of an enabling regulatory framework that allows for innovation while prioritizing safety," said Richard Branson, Virgin Galactic founder, in a statement. "It is this which has allowed us to pursue our dreams and which will ultimately underpin our commercial success as we seek to democratise space for the benefit of humankind." To be eligible for Commercial Astronaut wings, pilots and flight crew members on FAA-licensed launch or re-entry vehicles must fly beyond 50 miles above Earth. Although recognized by the FAA, Stucky's and Sturckow's Dec. 13 flight fell short of the internationally-recognized altitude of 62 miles (100 km), referred to as the KÃ¡rmÃ¡n line, used to establish astronaut status by NASA and the Fédération Aéronautique Internationale (FAI), the latter the ruling body on world air sports.